부에노스아이레스에서 여행하기 편리한 숙소를 찾고 계신다면 올모 도라도 비즈니스 호텔 앤 스파만큼 좋은 곳은 없습니다. 본 3성급 숙소는 공항에서 단 35 km 거리에 있어 쉽게 이동할 수 있습니다. 본 숙소는 Basilica Santa Rosa de Lima, Bien-Gaucho, Edificio Otto Wulff 등과 같은 도시의 주요 명소들과 가까운 거리에 있어 투숙객이 편리한 여행을 즐길 수 있습니다. 본 숙소(올모 도라도 비즈니스 호텔 앤 스파)는 최상의 서비스와 다양한 시설을 제공하며 고객의 편안한 투숙을 위해 최선의 노력을 다하고 있습니다. 투숙객들은 숙소 내에서 24시간 룸서비스, Wi-Fi (무료/전 객실), 장애인용 편의시설, Wi-Fi (공공 장소), 주차장 등을 즐길 수 있습니다. 모든 숙소에는 편의 시설이 마련되어 있어 비할 데 없는 편안함을 선사합니다. 본 숙소에서 온수 욕조, 피트니스센터, 마사지, 정원 등을 즐기며 편하고 완벽한 휴식을 취할 수 있습니다. 본 숙소(올모 도라도 비즈니스 호텔 앤 스파)의 좋은 위치와 서비스를 충분히 즐겨보세요! 직원들이 매우 친절하고, 전철역이 가까이있어 교통도 용이하고, 객실도 매우 깨끗하고, 미니주방이 있어 편리했다. 호텔이 중심가에서 약간 떨어진 곳에 위치해있지만 H선 Venezuela전철역이 가까이에 있어 시내로 나오는데 20분정도 걸렸다. 근처에 중간정도의 마트도있고, 네블럭 걸어오다 만나는 큰 길에는 국제공항(EZEISA)가는 버스 86번과 8번이 있다. 비록 국제공항까지는 2시간이 걸리지만 한사람당 2페소(환화600원)로 가격이 매우 저렴하다. 택시를 이용할 경우 130페소이며 40분정도 소요된다. 호텔에서 제공하는 지도 하나만 있으면 브에노스 아이레스를 별 무리없이 여행할 수 있다. 새롭게 연 호텔이어서인지 깨끗하고 산뜻했다. 가격에 비해 괜찮았다. 직접 음식을 만들어 먹을 수 있는 편리함이 있다. 조금 중심지역과 벗어난 지역이어서 약간의 치안문제가 신경쓰였다. Making an on-line booking is always dicey, But I was exspected. Given a quiet room. Served pleasantly and in a friendly manner and received my wake-up call on the dot......rare indeed. Room was clean, convenient and pleasant. Nice hotel, the room was very clean. People at the reception desk was very helpful. Nice staying and the location is not bad..
Well maintained, with larger rooms and some nice extras. We only stayed one night as a stopover on our way back home. The hotel is very clean, with well appointed larger rooms, including a small fridge, hotplate, and sink in a small 'kitchen' area. The included breakfast was a bit above average, and the staff very helpful (they understood enough English to converse with disadvantaged unilinguals from North America) The drawback to this place is it's location. It is not near any of the cities attractions, not even any restaurants. However, to offset this a little, I would note that it is only a 5 minute walk to the nearest subway station (on the new H line), so any of the areas you would want to explore are at most a 20 or 30 minute ride away on B.A.s efficient, incredibly cheap underground system. 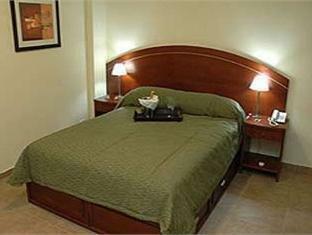 The hotel is located in working class neighbourhood of Buenos Aires. It is small and nothing fancy. The area looks really oldish and does intimidate a little bit at night. The rooms are small but come with a kitchentte and Balcony. The closest commercial area is Larrea. It is an okish hotel but honestly for the money you pay for this hotel, there are better deals available in Buenos Aires. Though the room was clean and tidy, it was small. The location was a bit far from everything. Only stayed for one night. hotel is only good. bed and clean Bath. room and bed small. 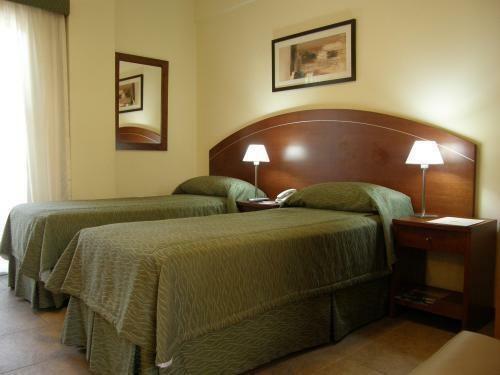 The hotel has a nice location and is very near from the subte (subway station) Venezuela. The staff is polite and very helpful. The speed of the wireless internet is good and the services of the restaurant are fine. We enjoyed very much our stay at Olmo Dorado. The hotel has a nice location and good access to buses and the subte (subway). 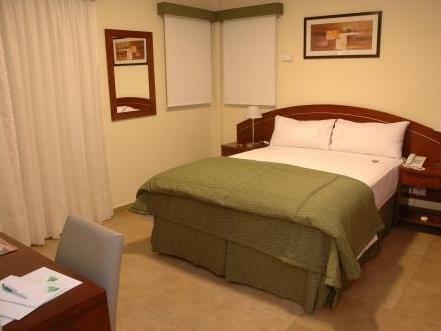 For people who don't want to spend a lot of money with accommodation, it's a safe and very good choice. L'hôtel n'est pas très bien placé, même si le métro est à quelques minutes de marche. La déco est assez vieillotte, l'odeur n'était pas du tout agréable, on a du aérer longtemps la chambre. Le staff n'est pas très amical et ne parle pas du tout anglais (ils nous ont dit qu'ils n'aimaient pas cette langue). Les chambres ne sont pas insonorisées, on entendait tout ce que faisaient les voisins... La cabine de douche fuyait, toute la salle de bain était inondée. Internet fonctionnait bien, la cuisine était très fonctionnelle et le balcon agréable. La atención del staff, la cercanía con puntos de interés y buena comida. En primer lugar debo destacar que mi experiencia particular fue muy agradable ya que la atención y el trato del personal del hotel fue muy cálida, me sentí como en una segunda casa. El hotel es cómodo y se encuentra cerca de varios puntos de interés para el viajero, además de que se brinda bastante información como para disfrutar al máximo la estadía en la ciudad. Definitivamente me gustaría volver a Buenos Aires y quedarme en el Olmo Dorado nuevamente. Atendimento cordial, Localização próximo ao metrô, Limpeza ótima, Estrutura completa. Indico o hotel para passar um tempo em Buenos Aires, muito bom o atendimento e hotel de uma maneira geral é excelente e não possui um tarifário alto para o preço da região. Box do banheiro muito pequeno, wifi no quarto nao tinha. Gostei muito do hotel e pricipalmente dos recepcionistas. São bastante atenciosos e te ajudam no que tiver ao alcance deles.